It was a one-sided contest. Belgium only managed to threaten the US’s defensive third an handful of times, and never managed to get a shot on target. The Red Flames were so clearly outclassed that after four goals in the first half, the ref added no stoppage time. Even she could see that Belgium needed a break. In total the US scored six unanswered goals, with a rotating cast of attacking players that really showcased the depth that most national teams could only dream of. Realistically, being able to bench a player like Megan Rapinoe, and rotate players like McDonald for Pugh, Dunn for Morgan, or Horan for Long, this team is clearly playing with unbelievably strong players occupying roster spots eighteen through twenty three. Unfortunately that doesn’t mean the USWNT is an unstoppable juggernaut. 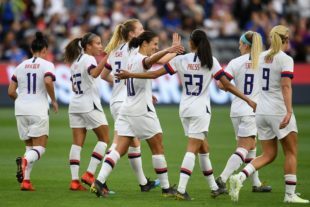 This springs SheBelieves Cup showed them to be mortal, only able to earn draws against an ascendant England and a Japanese team that looks to be on a rebuild. Even in Thursday’s powerful victory, where the US scored five goals, there’s reason for concern after also allowing Australia to score three of their own. The Matilda’s are not a team to be trifled with, and the fact that they scored isn’t of particular concern. But will this firecracker offense be able to carry the team when facing stiffer opposition like Germany or France? If not, can the defense find a way to shut down the goals that keep finding their way into the US net? Realistically, we don’t know. As discussed the Belgian attack was toothless at best, and we never got a chance to see if Alyssa Naeher could protect the goal and silence her critics. We never even got to see if Ashlyn Harris would be a worthwhile replacement even though she was on the field for the whole second half. Ali Krieger, Becky Sauerbrunn, Tierna Davidson, and Crystal Dunn started on the backline, but through no fault of their own had minimal impact on the game as Belgium struggled to get the ball past midfield. Head Coach Jill Ellis’ decision to take Dunn off for Alex Morgan seems less about Dunn’s performance and more a concession to the reality that defense didn’t matter in this game. So how can the US defense test itself? Unfortunately the warm-up friendlies in May might not bring any answers. South Africa (ranked 49th in the world) won’t present a meaningful challenge, and while New Zealand should prove a fun game they’ll challenge the US even less than Australia. The final friendly, against Mexico on May 26th, will of course be loaded with with symbolism from the men’s game, but unfortunately despite the tremendous progress Liga MX Femenil has the possibility of being even more one-sided than the Belgium game. As a result, the questions unanswered on Sunday night in LA are likely to remain unanswered until the World Cup. Playing Emily Sonnet (a natural center back) at RB is part of the problem. If O’Hara is injured, I am not understanding the decision to leave Ali Kreiger on the bench? She’s a veteran with a good 2way game.